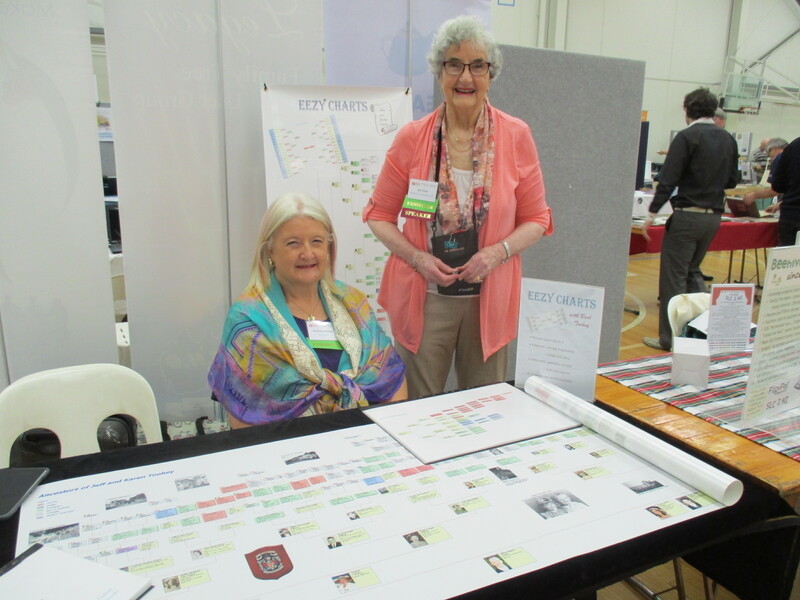 Unlock the Past held a two day history and genealogy expo in Adelaide and as this was a huge event, I am dividing the report into two, one for each day. Day One attracted lots of people, not only those in Adelaide and South Australia but I also caught up with friends from WA, VIC, NSW, QLD and even a couple from New Zealand. Not to mention meeting lots of new people too. It was amazing how many people traveled to the Expo and it was more like a conference in some respects. There was a lovely canvas tote bag to hold all the goodies you collected from the various exhibitors. Mine filled up on both days and yes there were a few book purchases. I was keen to go to the Expo because my Cornish great great grandparents James Henry Trevaskis and Elizabeth Rosewarne married in Wallaroo on the Yorke Peninsula. My great grandmother Dorcas Trevaskis was born at Moonta in 1866 so I have always had an interest in Cornish culture. One of the key speakers was Professor Philip Payton and I have his books so listening to him would be a bonus. Max of course is South Australian having been born in Port Lincoln and grown up in Berri. So lots of family history interests to follow up at the Expo. There were so many exhibitors and speaker sessions it was almost impossible to fit everything in, especially if you also wanted to eat, drink coffee and chat with people. The venue was good with lots of room for all the exhibitors and the main theatre was good for key speakers. The mini sessions were in the main exhibitor area and were a little hard to hear or see depending on the session and speaker. For refreshment, locals could bring their own but most of us seem to have taken advantage of the onsite coffee van and Vili’s van. I will confess straight up that I had a Cornish pasty both days from Vili’s and this is something that I simply have to do every time we visit Adelaide. I arrived early with the lovely ladies from FIBIS (Families in British India) who were also staying at the same motel and kindly offered me a lift both days. As they had to set up their stall, I was free to wander around and check things out before the expo officially opened at 10am. The first speaker I went to was Philip Payton talking about Cornish emigration around the world and it was more like an academic lecture with no slides or images. He also talked about the myth of Cousin Jack and Cousin Jennie. While interesting I would have liked a few URLs to follow up now that I am home. Other talks on at the same time looked at German research, Lutheran Archives, Freemasonry, the 75th anniversary in 2017 of the bombing of Darwin in WW2, FamilyTreeMaker and a beginner’s session. As you can see lots of choice and that was just the first hour. The next two sessions I went to were on the State Records of South Australia and the State Library of South Australia. I use both of these websites on a fairly regular basis but it was good to find out what’s new and what’s coming up and particular things to look for. With State Records they did a case study which highlighted all the different types of interaction with government including passenger lists, rate books, hundred maps , land tax returns, inquest files and school admission registers. In response to a question we found out that less than 1% of their records are digitised but they are starting to upload passenger lists to their website. With State Library we learnt they have SA directories online, some maps, government gazettes, transcribed letters and diaries and photographs. Plenty to keep anyone busy. There was a 30 minute session both days with no talks so that people could have lunch but that did mean longish queues for coffee and Vili’s unless you went earlier or later. There was shaded bench seating outside the venue and even some tables and chairs (both inside and outside) and lots of people took advantage of these to chat and discuss family history. 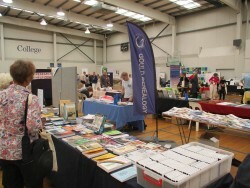 Otherwise it was time to visit some of the exhibitors and the photo shows just one half of the room! My session on Digitised Newspapers was first after lunch and attracted a large crowd. (You can find a copy of the presentation on the Resources page of my website, scroll down to Presentations.) A few slides into my talk the laptop battery went flat which caused a few minutes of confusion while we tried to find IT assistance. Just as a member of the audience found the power supply the cavalry arrived and we carried on but it does tend to throw your concentration. I then had my lunch and a much needed coffee before wandering around the exhibitors. As Max has a Tasmanian convict who dies in Darjeeling India I went along to Sylvia Murphy’s talk on British India research. Again FIBIS is a website I have used a lot in the past but obviously I am not making the most of the resources. The database is free to search and there is some members only resources. There are church photographs and digitised Google books relating to British India I seem to have missed and of course, new material is always being added. It was a good example of why we should always look at every menu option and drill down to find relevant information not always obvious from the headings. The final talk of the day that I went to was Brad Argent on Ancestry DNA and as I was down for the panel session on DNA on the next day, I wanted to hear Brad’s talk. For some reason his slides didn’t work on that laptop but he went on to give a talk without prompts and I always like it when people use their own family interests as examples. The autosomal test matches up to about 4th cousins. At the end of the session Brad gave away the Ancestry DNA kit that he had been using as a prop. There were so many talks I would have liked to go to but I got caught up talking to exhibitors. 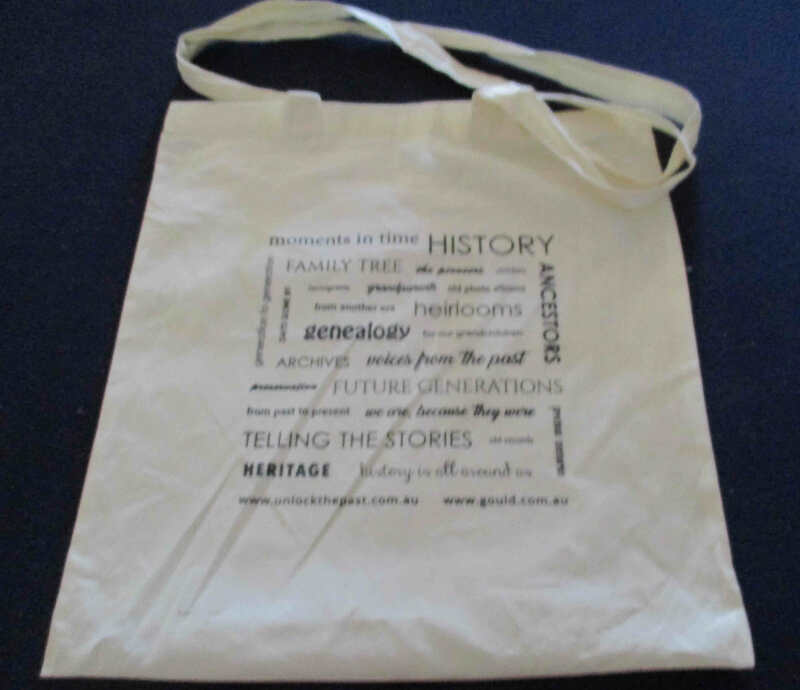 For example, there were local history societies there as well as genealogy societies and I was talking to someone from Alexandrina Libraries Local and Family History Room about Goolwa where Henry Spencer was living before he returned to Queensland. If I send them what information I have on him and his life in Goolwa they will see if they can find out anymore for me. There is a wonderful photo we have of a house and I don’t know if it is in Adelaide or Goolwa but they may be able to help identify it. Some of the speakers and exhibitors went to the Glenelg Football Club for dinner and that was another good opportunity to catch up with people. The meals were surprisingly fast, the wine reasonably priced and the food excellent. My seafood trio (fish, prawns and calamari) was really nice and came with chips and salad. The Kopittkes (both Eric and Rosemary gave talks each day) had the biggest burgers I have ever seen so I was most pleased that my meal was not mega sized. Then it was home to the motel for a good night’s sleep so that we could do it all over again on Day 2. Stay tuned. You always share such comprehensive reports. Thanks from someone who couldn’t be there.